Fierce: Riding the wave fiercely with no fear. is a room of painting, sculpture, collage, and assemblage described by Canoilas as "machines to see". 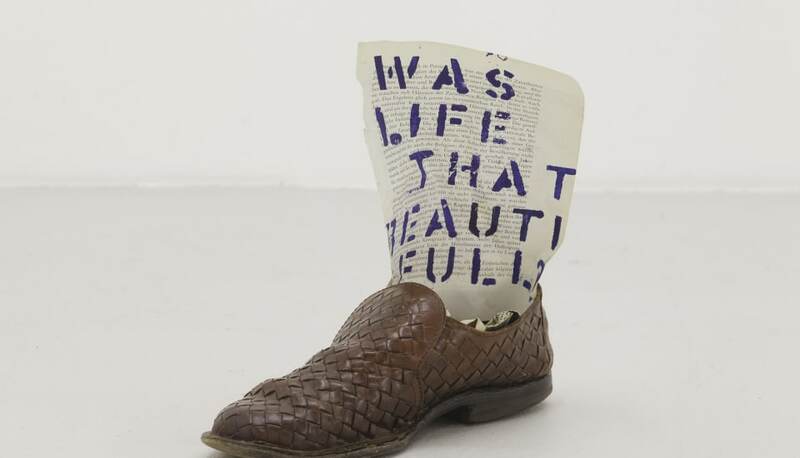 These works bring together wide-ranging material, objective images and text is taken from newspaper clippings, magazine adverts and poetry books combined with subjective matter (paint, glue, ink, and collaged cuttings from Canoilas' own 'automatic' drawings) that cover and intersect with each other to create diagrammatic receptacles of chaos and information. Manipulating artwork convention, the paintings are double-sided and suspended in the space as multilayered and multifaceted objects. Canoilas challenges us to experience the work as diagrams where chaos is not organised but experienced. "The works continue the idea of 'diagram' that I have been exploring in both small-scale works and installations. The work comes from a platform that is never empty: the white sheet, or canvas, or projection in your head is not a blank or white one - but is fully charged with the works you have seen, those you like and hate, social and political events. The first act is usually a clichÃ©, something that comes more with expectations from the exterior, a certain idea of what might be art or not, accepted. The next steps erase this clichÃ© and push it into something new. I don't aim to organise this chaos. I want these works to operate as 'Disasters'. A disaster is an event, it happens and it can't be predicted and there's no explanation for it. It's a wild or savage event. It is of a different nature from normality and usually, its product is named as a monster. All of these qualities seem very fertile for Art today, against monolithic thinking and the oppression of the rational." Hugo Canoilas' work is strongly linked to the art historical evolution of Modernism. Drawing upon the philosophy, poetry and foundational ideologies of this period his work employs a wide variety of media (informed predominantly by Painting) to represent a political and aesthetic convergence that moves towards a sensitisation of the viewer to the socio-political undercurrents that influence historical and contemporary culture.